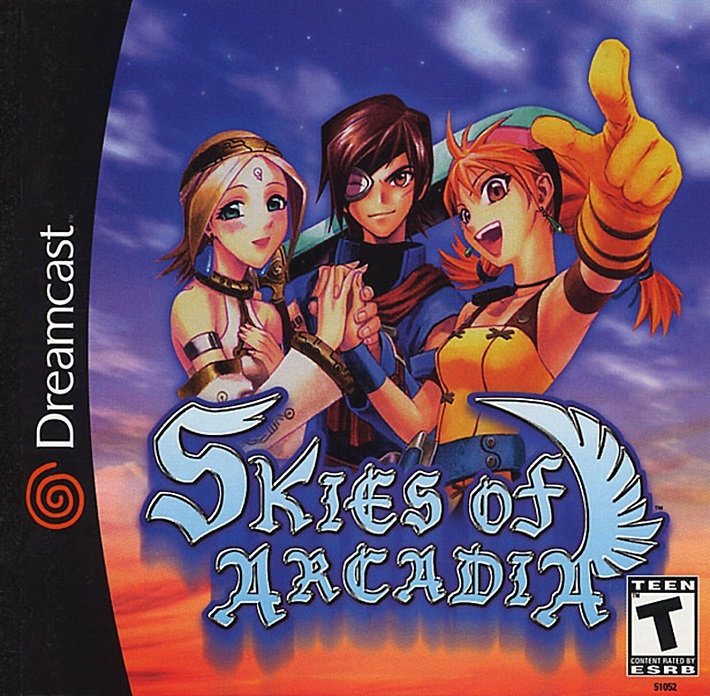 Lots of fans ask for a sequel for Skies of Arcadia, but to be honest... we really don't want that. At this point, it's been almost 20 years, and a sequel would have to be so different from the original in ways that would just make us upset, and we don't trust Sega to do a good job with a sequel anyway (see NiGHTS: Journey of Dreams...). We fought Piastol at such a high level, we were doomed to an unescapable fate of two-hour-long grueling battles. That asterisk we mentioned? In practice, there is a giant hurdle that prevents this game from being easily enjoyed: its fighting system. It's so slow, so bad, and so unfun. So much, that Rosy dropped it the first time she started playing it because it was just too long and grueling to play through it. Denise's brother Kevin and our other friends Lethe and Sophie likewise dropped it for the same reason. The two of us have since beat the game together, with both of us playing it, which improved matters since we could talk to each other, and one of us could draw in the meanwhile while the other got through the random encounters. And even still, we had to gauge every time whether we were ready to start a boss battle and whether we would manage to stay awake for two hours trying to beat Piastol. 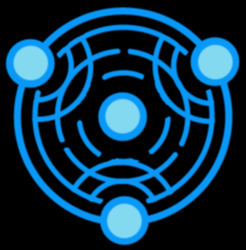 This is the symbol that appears when casting Blue magic. It is ruled by the Blue moon that rises over Yafutoma and is associated with the number 3, as well as the concepts of flow and motion, and the elements of wind and water. Blue magic allows the caster to summon these elements, and also to influence the speed of themselves and others, whether that means boosting their own agility or slowing their enemies to the point of sleep. The main way to improve the fighting system would probably be to make it so that the magic could actually work. There are all sorts of spells in Skies of Arcadia and they're very cool; the game presents a unique set of elements each with their own numerology and symbolism and concept, each influenced by one of the six respective moons of Arcadia, and reflected in the respective cultures that dwell under each moon. We love all the thought and creativity that went into designing this cosmology, and we want to use these spells so bad, but... with the exception of the healing spells and maybe the higher power stat-boost spells... they just... don't work. Magic is presented as something that should be a part of your standard arsenal: you attack and use magic, and occasionally pull off some Super Moves, powerful special techniques unique to each character. However, as it is right now, you will find yourself using Super Moves all the time and deciding to ignore the fact that the magic even exists, no matter how cool it might sound. 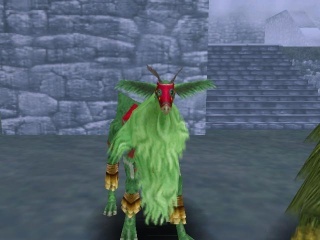 This is, in part, because using magic drains both the party's collective Spirit Point pool, which accumulates over time within each battle, as well as Magic Points, which is per character and never regenerates until you leave the dungeon and spend money to stay at an inn (or use one of the limited Magic Droplets which restores a whopping one MP at a time). Compare using magic with the Super Moves, which require only the ever-regenerating Spirit Points to unleash. Given that magic takes both Spirit Points and the non-regenerating MP, casting magic is expensive. Not only that, the special effects caused by magic have a low success rate: if you cast Noxi hoping to poison an enemy, there is only a chance that the enemy will be poisoned, and somehow it always seems to fail. So, trying a spell almost always results in a wasted turn, wasted MP, and wasted Spirit Points, all of which could have been put to better use. We quickly learned that using magic in battle is just not worth it, and we'd be better off just relying on basic attacks, guarding, and the Super Moves. Yet, without being able to effectively use magic, the variety of what you are able to do in battle is extremely limited. It felt like all we were doing over and over was, Aika do the spread move, Vyse do the strong move, Fina do the healy move, and the fourth one does the shieldy/support move. Rinse and repeat for two hours. 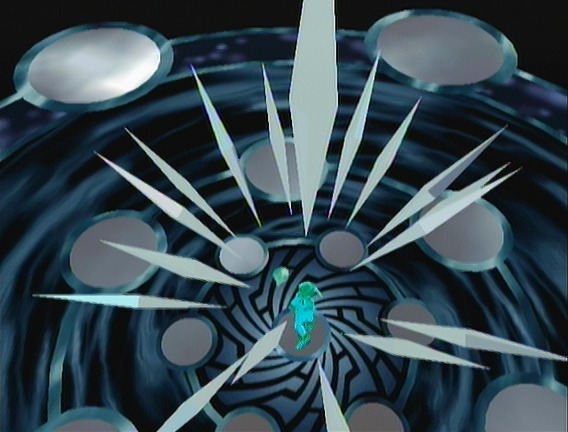 Fina is about to be hit by the Silver magic Eternum spell. Fina is already dead. Adding insult to injury, the battle system is skewed so that, while you can never really count on using magic, your enemies can - in fact, they can so well that they rarely ever fail. In particular, bosses are immune to pretty much all magic... but they can use the same spells against you, and succeed virtually every time. The most notable offender being the Silver magic Eterni-line of spells, which are instakill moves. You can never expect to be able to use them, but the bosses spam them as if they were going out of style. To propose a fix for this situation, rather than just say we don't like it... the rate of success for your magic should be the same as your enemies, and it should be possible to use the spells against bosses. Wouldn't it be only logical to be able to use a poison spell at the beginning of a long battle, and wouldn't having the ability to actually strategize improve the game? As for what concerns the instakill mechanic, we can see how it would be unfair if you could instakill everything all the time. We can also see why bosses would need to be immune to instakill moves, but then they use them themselves, and it's so annoying, unfair, and just not fun. At this rate, we think they could be removed entirely from the game -- it is bit of a shame for the idea of Silver magic, as it deals with both the concepts of death and resurrection, and that's cool... but, lore aside, at least battle-wise, nothing would be lost. Being able to inflict sudden death is just an idea that unfortunately doesn't work in this game. For more invasive fine-tuning than simply eliminating the boss immunities and the Eterni-series spells, we think it might be even a good idea to drastically overhaul or even eliminate the system of Magic Points entirely. The easier alternative to explain and to implement successfully is to simply eliminate MP. The way it is right now, at the beginning of the game, when magic would be the most needed to experiment with and the most critical to supplement the limited abilities so far unlocked, the characters all have so little MP that you must actually be extremely frugal with using magic. 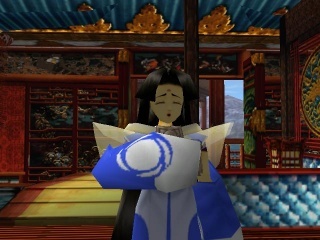 If you are trying to work your way through a dungeon, and if you are counting on Aika to be able to use Sacri outside of battle a few times to heal the party, you have no points to waste on trying out attack magic like Pyri, especially when Aika can already do her first Super Move, Alpha Storm, which doesn't use any MP. When games force us to be frugal, we must be conservative with what we have, and it is hard to gauge how long we will need to stretch our limited resources -- so what usually ends up happening is we never use the limited thing at all. If instead, magic only cost the regenerating Spirit Points to use, we wouldn't need to be concerned with its cost, and we could freely try out all the different spells on all the different enemies and more easily get a sense for how the system works without the fear or guilt of wasting a turn or squandering our limited resources. "Moons, give us your blessing." 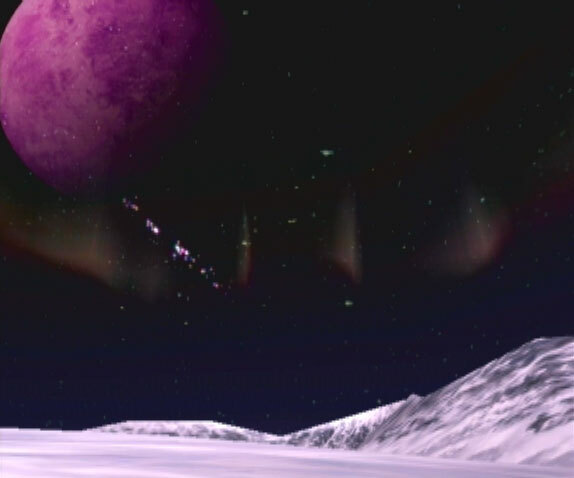 The game presents magic as powers derived from the influence of the moons and amplified by crystals recovered from fallen moon-rocks. On discussing the possibility of eliminating Magic Points from the game, we first wondered if the in-game aspect of this would be lost -- but in actuality, the lore is not that apparent in the current system, and perhaps, instead of eliminating MP, this connection could instead be enhanced. Because, thinking more about it, it doesn't really make sense that every character has just one statistic for their MP, and using magic simply drains their generic Magic Points. In many games, this is standard and works fine, in that all magic is believed to come from the same source (if the workings of magic in a game's universe are explained at all). In the world of Arcadia, however, each type of magic is separate and arises from the power of a different moon. So, actually, rather than one MP statistic, each character should have six potential pools of Magic Points, one for each color of magic and associated with each moon. We can imagine such a system of six magic bars becoming very complicated very quickly, and also being very annoying if not implemented well. However, if done right, it could also give rise to a lot of interesting mechanics. 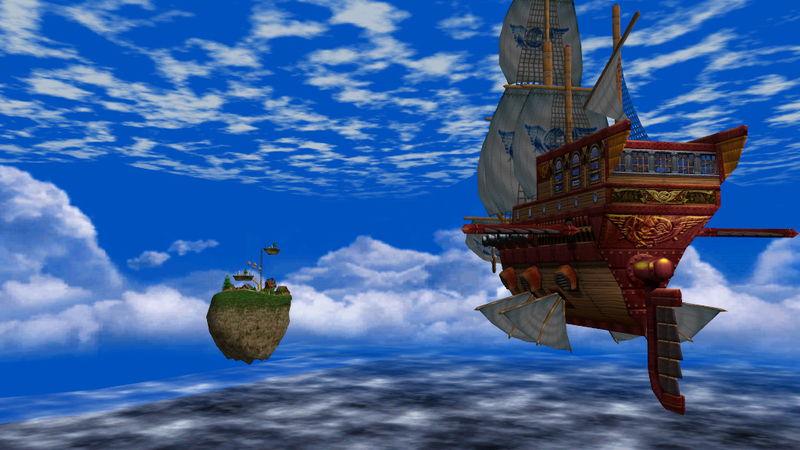 You spend much of the game exploring the world and moving from the domain of one moon to another -- one of Denise's most happy nostalgic moments of Skies of Arcadia is when you sail over one of these invisible borders and the music subtly shifts as you see the another colored moon rise in the sky. What if, depending on your distance from the relevant moon, the associated magic would be powered up or down, and the different MPs would regenerate at different rates? This would make the game more dynamic in that you would need to adjust your strategies around which moon you were currently under. 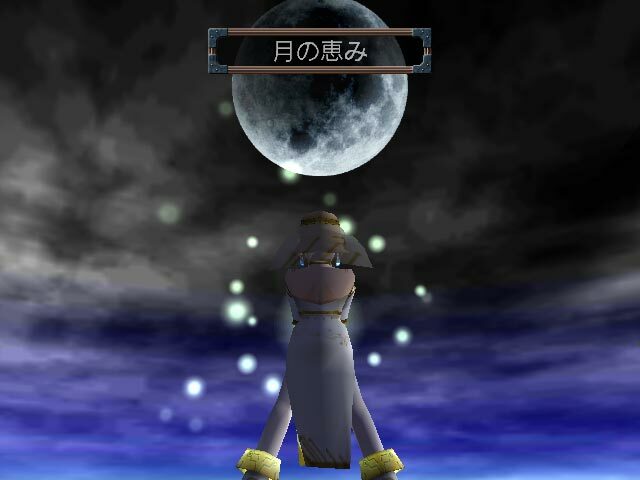 It would also strengthen the game's focus on the moons, and help the player think more like an Arcadian, with the moons as a paramount consideration. There is probably more fine-tuning that could be done to the fighting system, but we think these thoughts about magic are the main points that could use a fix. We'd probably also make the turns themselves play a bit faster, especially in the airship battles where, yes, it's very impressive for the year 2000 that the ship is turning around and so on... but it makes things so much slower. We've literally fallen asleep during the airship battles. We like the eyecandy, just make it so that you never have to wait a solid two minutes between turns because the ship is animating. BOOM! Get used to the screen just randomly exploding. 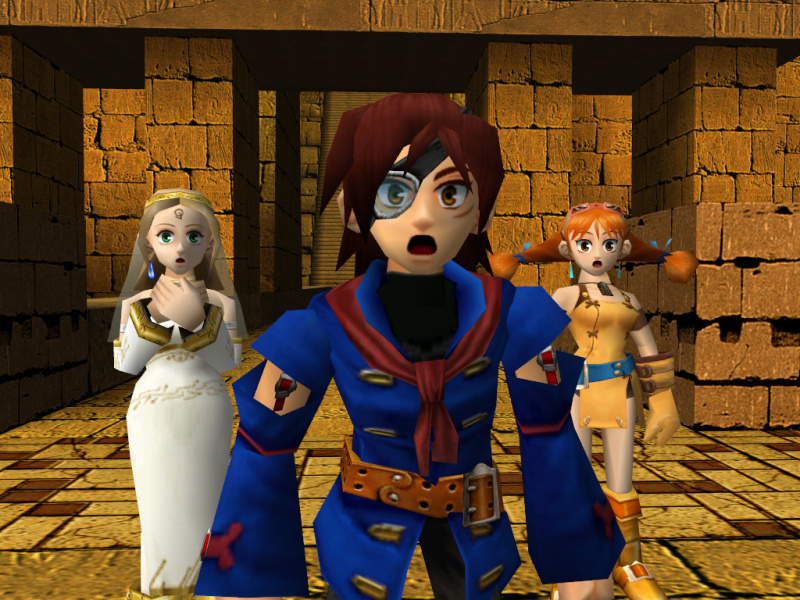 Skies of Arcadia is notorious for its relentless random encounter rate. We joke that just thinking of Skies of Arcadia triggers a random encounter. Skies of Arcadia Legends, the enhanced remake for the GameCube, already cut down the random encounter rate from how it was in the original Dreamcast version, but it's still way too much. 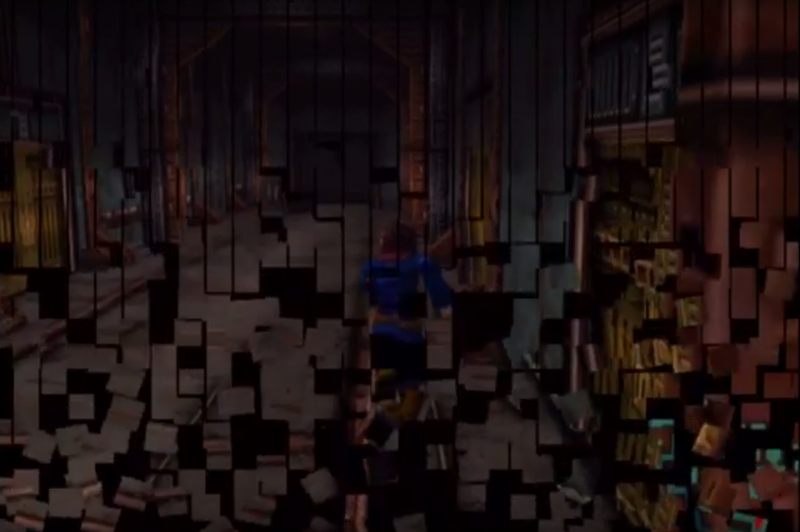 If we could have a new remastered version, we'd drop the random encounter rate a second time, and/or we'd make the enemies have a visible model wandering on the map that could be encountered at will or dodged. They already did that with some special enemies and hostile ships that wander in the sky, so it doesn't seem too out of place to do it for all the other enemies as well. 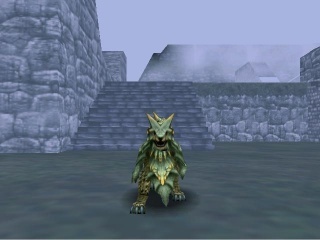 Having the monsters visible in the dungeons would also add to their looks, which currently appear to be very empty. While that is in itself interesting and gives all the dungeons a lonely and forgotten feel, it doesn't match what's really happening, considering that, actually, you're fighting a bunch of monsters every three steps - they have to be there. So just imagine how lovely the Ixa'Takan ruins of Rixis would be if you could see the actual wildlife! Just imagine if you could see the elk-like Que'lak and wolf-like Ferlith wandering through the beautiful misty ruins of Rixis. Did you say more than 3 polygons?? While we're imagining the game being remastered, we'd update the textures and add normal mapping. Skies of Arcadia already looks impressively good for being so old, so not much would need to change, but yeah, you could obscure the three polygons they had a little bit better. 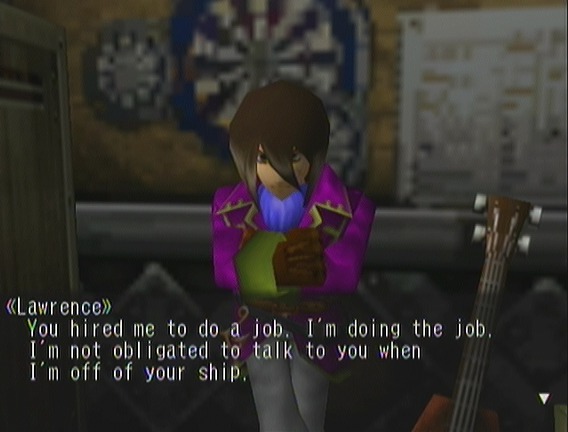 One of our biggest pet peeves about Skies of Arcadia is the way they did the voice acting. They obviously did not have the budget or the disc-space to have a game from this time period be fully voice acted, and that we can understand. But despite this, they did indeed voice-act a few key phrases for each character, which occasionally will accompany the character's written dialogue. For example, I am just making this up, but Aika may say "Yay!" aloud while her dialogue box says "That's a great idea! Let's go!". This happens infrequently enough that, many times, I would be happily reading along, and then jump out of my skin when Aika unexpectedly goes "Yay!". If they couldn't do voice acting, I think they should have just not done voice acting at all. The few phrases can be spoken in-battle, but if I am reading, I don't want someone saying something aloud that is usually not even the same words, all out of the blue. Most egregiously, Moegi only has one spoken bit of dialogue. She says "Yes" aloud. 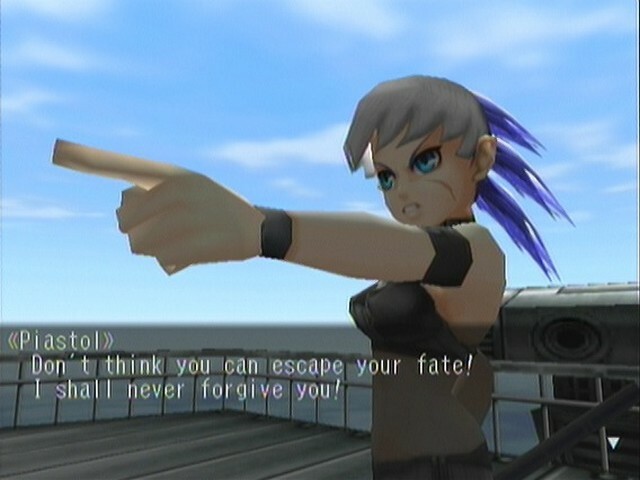 Comically, there is one part of the game where her written dialogue says "NOOOOOO! ", but her spoken phrase is "Yes". All we can say is, "NOOOOOO!" So, for a remake, we would give the player some options: keep the original partial voice acting, turn it off, or switch to the Japanese. If we had enough budget, we would say to maybe even completely re-voice-act the entire game. I guess we can't necessarily expect to have all the original actors reprise their roles anymore, but see if we can get some quality voice acting throughout the game for the fans who would appreciate that. We don't trust Sega to do this now, but in an ideal world, we'd want to a few lingering questions to be addressed and some backstories expanded. This section has spoilers, so read at your own risk. They already added some revelations about his backstory in Legends, but we are still left with some big gaping questions about his character and his motivations and why should we care. Other characters say he was once as nice and innocent as Fina, but when we meet him he's completely lost to the depths of being a Bad Guy and... it's not really believable? And so little effort is made to save him? So it just kinda feels bad, you know? Enrique and Moegi standing stiffly together. While it is totally obvious that Moegi and Enrique have a thing for each other, the problem is, you are playing the game as Vyse, and while Vyse notices that they are hanging out a lot, and they are off talking together, and that they are in each other's rooms a lot... we don't get to know what they are talking about very much, because when Vyse shows up, they get awkwardly quiet. 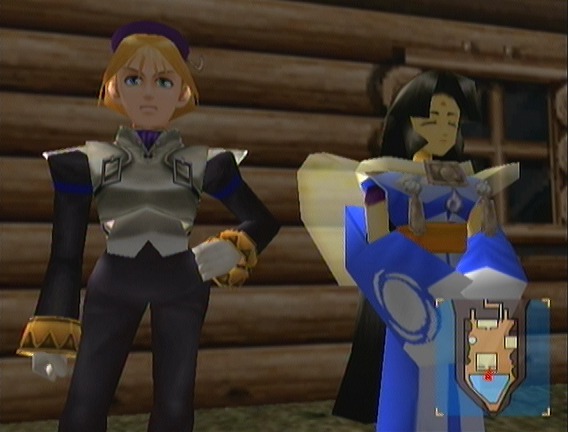 While we actually really like this idea... it would be nice to maybe have a cut-scene without Vyse, where we can see Enrique and Moegi actually have a conversation, without the awkwardness of Vyse being right there, so that we can understand the type of relationship they have, and how they interact together, and so on. That would be nice. Also, we'd ask for Moegi's character to be expanded on her own. She is treated as a major character by the plot, but we as the players get to see and know very little about her. It would be nice to understand her better. She is the Princess of an entire civilization, and you'd think this would have more impact and provide more topics that she could discuss with the other characters and so on. Yeah, okay, Lawrence, but the rest of the crew doesn't have anything against talking, right? There's already a little bit information available about each crew member, and some of them have something of character development (Lawrence goes from practically refusing to speak to you, to actually giving you some words of encouragement, which speaks volumes), but there could be so much more with all the crew members. After all, we're supposed to get attached to these characters... Skies of Arcadia has a bit of the same problem as Valkyria Chronicles, in that, both games have a large cast of minor characters that you want to like and care about and learn more about, but they have just a few lines of dialogue and that's it. They don't need to be quite so minor! TELL US WHERE AIKA AND FINA'S SHIP WENT! We're still wondering about that ship and why did they never retrieve it! They worked so hard for that ship, and then they presumably just left it parked at Daccat's Island?! That plotpoint was completely left hanging! Close that plothole! We also personally think Aika should get to be the captain of her own ship, and you can play as Aika as a pirate captain in her own right... but I guess that would be sequel or alternate universe territory at this point, eheh. 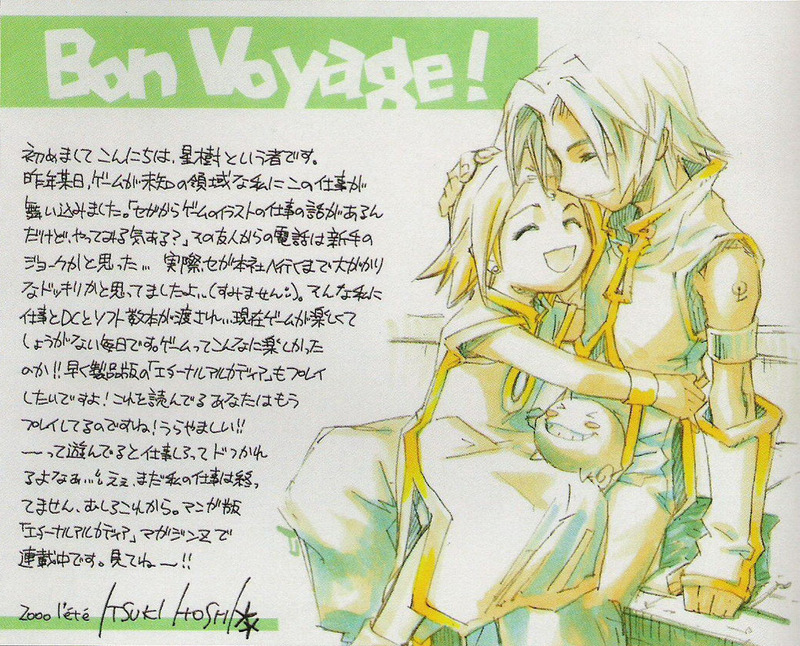 Skies of Arcadia still is a great game, which tackles a seemingly stereotypical plot in a very interesting way. The main cast draws you in, and the story takes place in a beautiful and fleshed out world. All the cultures feel coherent and are easily recognizable, the locations are still breathtaking despite the technical limitations, and each NPC, who, in other games, would usually would be represented by a generic placeholder, is a unique individual (only some of the shopkeepers have recycled models, but, in those cases, they have distinct names to set them apart). Treasures and mysteries are just waiting for the player to venture out into this lovingly-crafted world and discover them -- well, if you can manage to overcome the relentless and sadly boring random encounters. We do indeed highly recommend Skies of Arcadia, but keep in mind that asterisk until, maybe, someday, Sega re-releases this under-appreciated classic in remastered form. (Just, really, no sequels, please).